Bruce Nauman in his studio mock-up for Green Light Corridor (1970), Pasadena. (Photo/Frank J. Thomas. Courtesy Museum of Contemporary Art San Diego. Copyright 2018 Bruce Nauman/Artists Rights Society, New York. 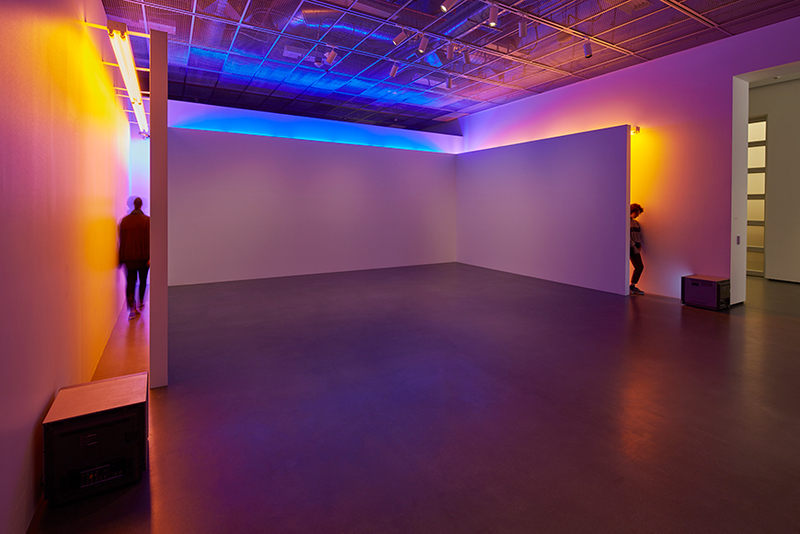 The first thing I would say about visiting Bruce Nauman: Blue and Yellow Corridor at the Jan Shrem and Maria Manetti Shrem Museum of Art, UC Davis, is "Don't get stuck." Bear in mind that this is the "Lunchable" column where I suggest things you can do during lunch or a short break, but with this one, don't eat lunch until after you walk through the corridor. This narrow walk and the surrounding details of Nauman that are part of the exhibition is having an extended showing through April 14. It had been the fall exhibition until so many people visited that the folks at Manetti Shrem decided to widen the opportunity. So to speak. I didn't make it all the way through the pastel-lighted corridor, which narrows as you progress, as I was certain the rivets on the back pockets of my jeans would scrape against the beautiful wall. (18 inches is not as wide as it might seem.) And, let's face it. I thought I might get stuck and have to call for help. Or, retreat back in the face of someone starting to make their way through the corridor. When I saw this photo (below) of Nauman, on the wall of the exhibition, I was certain he was making fun of me walking through that corridor. "Studies for Holograms 1970" are screenprints that greet the visitor to the Nauman Exhibition at the Manetti Shrem Museum. They are from the Fine Arts Collection, Gift of Norah and Norman Stone, 2016. 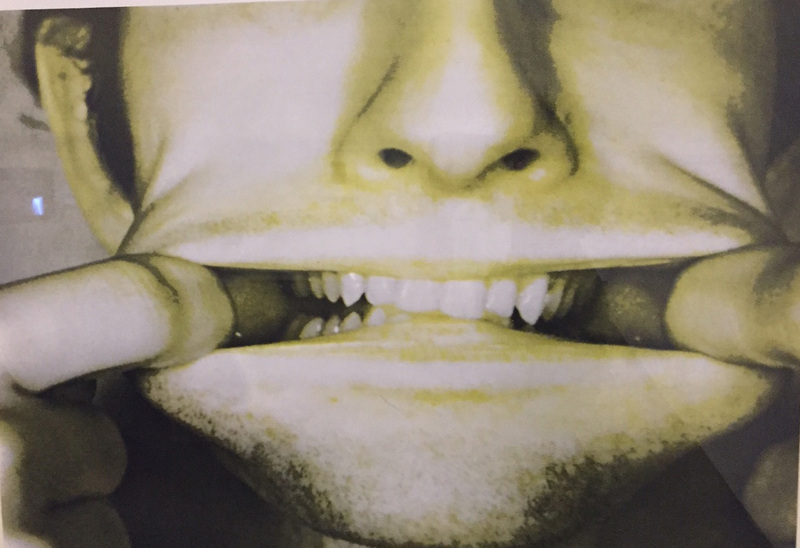 The series of images, depicting Nauman contorting his face, photographed by Jack Fulton, make you think that is what Nauman is "saying" to you after you've walked through his Blue and Yellow Corridor. But, it's a corridor, and so much more. Rachel Teagle, museum founding director, said in a presentation that she realized soon after the corridor was built that its experience was "theater." I would agree. You will also learn that this is the first time this corridor has been constructed and shown in public since he first designed it shortly after he was a student, and an assistant to Wayne Thiebaud, artist and professor emeritus. The drawings are part of the exhibition. Nauman came to UC Davis, at age 22, as a painter, then became a sculptor but he segued into performance and film. A pair of films from 1965-66 is also on view in the exhibition. The New York Times Style Magazine featured him on the cover recently, interviewing him at his remote horse ranch outside Santa Fe, New Mexico. The author of that story spent time with Nauman, and lent much insight into his personality and work. The story also says that Nauman's work "is often a test of how much we can endure." You might feel that way when you are walking through the corridor. But there's another thing you learn about Nauman by reading that article and seeing his photo. He's a stocky rancher these days. He probably wouldn't fit through the corridor anymore either. The Jan Shrem and Maria Manetti Shrem Museum of Art is free for all. Tuesday, Wednesday and Friday: Noon–6 p.m.
Saturday and Sunday: 11 a.m.–5 p.m.
Jan. 2–26, 2019: The Museum is closed for installation. Winter Season Opening Celebration, Sunday, Jan. 27, 2–4 p.m.